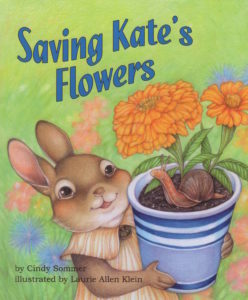 You are currently browsing the archives for the Saving Kate’s Flowers category. Okay – the first thing to know is – when i got the manuscript, the story was about a little girl and her mom. In other words – Kate and her family and neighbors were human, so that was how i originally intended to portray them. Of course i still wanted to give the illustrations an interesting twist and i started thinking about what sort of family this could be, maybe an ethnic look or an unexpected locale. That segued into finding reference photos, because i have learned from experience, if you are going to draw a sustained human character throughout a series of illustrations it helps – A LOT – to have pictures of a real person, preferably showing different facial expressions and poses. Somewhere in this process i started imaging the characters as animals and, next thing you know, i saw Kate as a bunny. I couldn’t just go off on a wild tangent like that without checking with the publisher, who in turn needed to check with the author, but after hearing my proposal everyone liked the idea and i began creating the world these characters would inhabit. Right from the start i pictured an up-dated homage to Beatrix Potter in that the animals, while being anthropomorphic, still retained a certain amount of natural look and behavior (where possible). They are still very much a part of regular, every day life with humans (like Peter Rabbit and Mr. McGregor or Hunca Munca and Tom Thumb in the little girl’s dollhouse) but you don’t physically see any humans, and although the animals look “realistic” they clearly behave a bit more like people than animals. I specifically tried to find a middle ground between Potter’s more naturalistic style and a Disney cartoon look because i didn’t want the characters to look too much like real rabbits but i didn’t want them to be too much like caricatures either. Semi-realistic is what guided the color choices and other details. 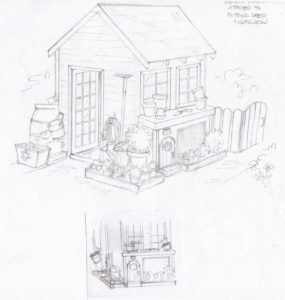 One of the first things i thought of was where the Rabbit family would live – a rabbit hutch attached to the human family’s garden shed. 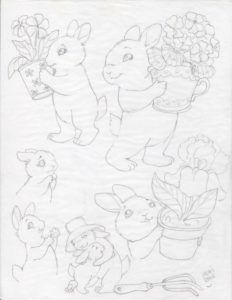 Though obviously the hutch would be more of a house – only with rabbit hutch touches (we once had a Dutch rabbit, named Barnaby, so i was drawing a lot on experience). I also wanted a tiny hint of clothing on the animals – nothing too extreme however. I wanted whatever the animals wore or used to be something they could make or find either in nature, or borrowed and repurposed from humans. [And YES – i really do get this bogged down in back-story minutia. What do they need? How was it made? What human object could work?]. 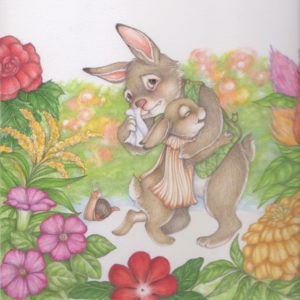 So Kate’s pinafore is based on an apron/garden garment worn by several characters from various books of the Victorian period but is a specific link to Mrs. Flopsy Bunny (from “The Tale of the Flopsy Bunnies” by Beatrix Potter). Kate’s pinafore is made from flower petals and her broach is a seed. Mom Bunny wears a scarf (because i love scarves) woven from the ribs and veins of dried leaves (not that you can really tell that in the illustrations, but it’s what was going through my mind). And her hat is woven from pine needles. Little side note: Originally i had Mom in the pinafore and Kate wearing the scarf, but realized the scarf looked older and more mature, while the pinafore looked younger – at least to me – so the switch was made early in the sketches. Dad sports a vest made of leaves and woven grass. 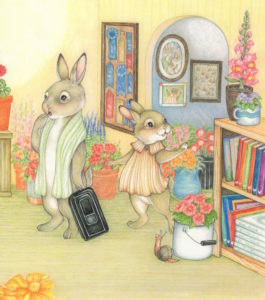 Since we were looking at the world from a rabbit perspective – as in, close to the ground, in a garden setting – i knew i wanted to have all sorts of bugs and worms, etc. In the first round of sketches the little snail was just in a couple illustrations but then i realized he could be a character in his own right. I have often tried to tuck in a hidden or unexpected character in my other books when possible, so the snail was perfect (i imagine he is either some sort of pet, or a close friend). Other butterflies, bees, dragonflies, etc. were added for interest and fun, and are all based on real species. 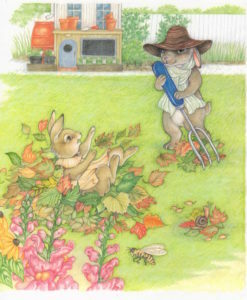 The “rake” and “shovel” the bunnies use are both examples of repurposing human-sized garden tools (hand rake and trowel, or wooden spoon) for rabbit needs. My mother collected toy rabbits (i’m not entirely sure when that started) and one of the toys from her collection is a lovely, realistic-looking Steiff rabbit. It is pretty close to life size so it sat on my drawing table throughout the entire project and i referred to it whenever i needed to check proportions when i wanted to use a human tool. Speaking of Human Tools. A word about technology. 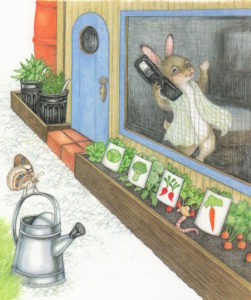 Specifically, what kind of phone would a rabbit use? I have to tell you – this was quite the dilemma for me. My first thought was an old, black (stereotype) dial & chord phone from my childhood, but i feared modern children today wouldn’t know what it was (and an old fashion crank kind was way too archaic). The problem with using the type of Smartphones everyone uses now is that they really don’t “look” like anything. They’re just thin, rectangular boxes. In the end i went with the type of phone i use (the flip phone) because i am that old and nerdy and do not have a Smartphone. Technically, i actually had a phone older than Mom Rabbit’s flip-phone (a 2nd generation Nokia) but thought the flip-phone would be funnier. Ironically, my beloved Nokia stopped working during the course of these illustrations (well, it actually still worked just fine – but the service providers started phasing out the older generation technology and no longer supported my Nokia.) so i had to get a new phone and – naturally – i picked the flip-phone. And it is actually the very phone Mom Rabbit is using. 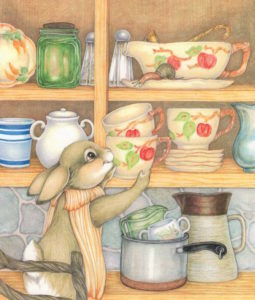 The Rabbit Family Kitchen – Ah, i had great fun imaging how this would look. And how a rabbit family would decorate. I went to a local pet store to see what kinds of things they used for rabbit hutches (as well as went back through all the Rabbit Care books i had from our Barnaby days) for inspiration. I struggled with the kitchen table for awhile before deciding on a slice of tree trunk for the top and a base made from a bucket or barrel. The chairs are made from twisty roots and vines. The tile floor hints at the wire grating one might use on the floor of a rabbit cage, and the window is screened with similar rabbit hutch/cage wire. The throw rug in the kitchen is woven from weeds and grasses and the living room rug is woven from the hay generally used for small animal bedding. The cabinets are basic plywood. The back-splash is made from stones and pebbles. And rough, weathered wood is used for the window sill and molding. NOTE: The two glass containers on the kitchen counter hold rabbit food pellets and grasses – for easy snacking. Inside the kitchen cabinet – we find my china, inherited from my grandmother and my great aunt (who both liked the Franciscan Ware Apple pattern). The lesser-known Carrot pattern serving tray was a fabricated after-thought. Another spur-of-the-moment addition was the blue and white cup – thus linking it to the cover (that cup, by the way, was inspired by the take-out, Greek-looking cups found in New York). The white ironware container is also a family piece (my mom had a whole set of them), the Revere Ware sauce pan is mine. The two-handled children’s mug is based on one my daughter had as a baby. And the rustic two-toned ceramic pitcher is based on the one i got in college (made by a fellow art major) that currently props up books on a shelf in my living room. 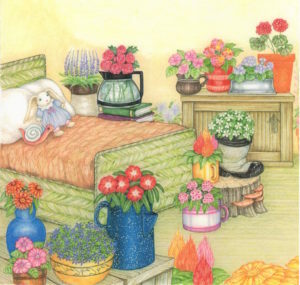 Kate’s bed is based on a woven rabbit bed i saw at the pet store. I struggled with what material the blanket should be and in the end decided it was woven from leaves, or maybe burlap. The toy rabbit on the bed is from my Mom’s collection. And the toy snail was inspired by my daughter’s vast Beanie Baby collection (tho in different colors). Dressers are made from crates. The stool at the foot of the bed is a tree stump. And bottom center of the page you can see the tops of the flowers that are on the cover of the book. Per my research i learned that there are Rabbit Shows (like Dog and Cat shows) so the ribbons on the bulletin board are ones Kate has won. Out in the hall is a family photo of Mom, Dad and Kate. There is also a picture of the entire Rabbit clan, and self-portrait by Kate. 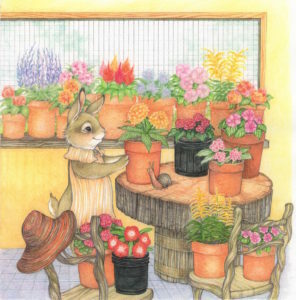 And in the book case you will find several Beatrix Potter books, “Rabbit Hill” and “The Velveteen Rabbit”, as well as copies of ALL the books i have illustrated for Arbordale Publishing. The Neighbors! Again – when i thought of changing the characters from humans to animals i had a wonderful time figuring out who the neighbors would be. 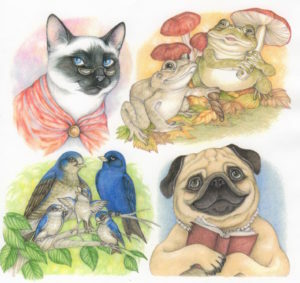 Mrs. Chin immediately conjured up an image of a Siamese cat (who is wearing the same shawl as seen on Jemima Puddleduck, a nod to another Beatrix Potter character) and the “Dog Lady” (as she was described in the original manuscript” struck me as a pug. (NOTE: she has chewed the corner of her book). I wanted to show a variety of animals that would be found in a typical suburban neighborhood and the Martin family easily became Purple Martin birds. Originally the Hoppy family was called the Rowes and i decided to make them toads because it was another nod to Beatrix Potter and because i knew Kate was going to be stopping by their house so it gave me a great opportunity to show a Toad House (the author later changed their name from Rowe to Hoppy to better accommodate their new look). Mrs. Chin’s house is an example of the animals interacting with real humans. Mrs. Chin’s “door” is the cat flap in the back door of the human’s house (featuring her own oriental/Asian touches). The Hoppys live in a simple toad shelter made from a broken clay pot. The Martin’s bird house is based on a real Purple Martin bird house. And Mrs. Pug, naturally, lives in a dog house (she is drinking tea from her water bowl, and she has “dog-eared” the the page in the book she is reading). For the other neighbors i purposely chose animals that most people would be likely to see in their yard or neighborhood, and i tried to illustrate the kinds of homes they would realistically live in. 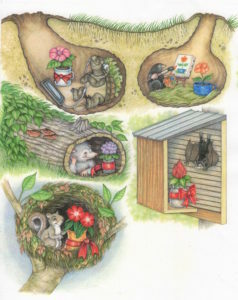 The Bat Box, squirrel nest, and tortoise and mole holes came to mind immediately but i’ll admit i took a little creative license with the o’possum log because that just fit the space best (but i figured it probably wasn’t too far pff from what a wild o’possum would use for shelter). And yes, it is something of a visual joke that the “blind” mole is painting a picture of his flower. And that – i think – covers all the little hidden, and not so hidden, decorative touches found in the pictures. But if you see anything i missed or have any other questions about the illustrations – please let me know. because i LOVE talking about the process! !